Throughout the years, elaborate programs of exercise have been instituted in response to the treatment needs of the scoliosis patients. The creeping exercise advocated by Klapp were discarded when problems with children's knees forced the discontinuance of such a program. Exercises that overemphasized flexibility created problems by making the spine more vulnerable to collapse. When treating patients with S-curves, one must avoid exercises that adversely affect one of the curves, while attempting to correct the other. It is not surprising, therefore , that the usefulness of exercises in case of scoliosis has been questioned. For many years, the attitude has been that scoliosis exercises are of little or no value. The idea is not new. The following is a statement made years ago by Risser:"It was customary at the scoliosis clinic at ...Orthopedic Hospital, as late as 1920-1930, to send new patients with scoliosis to the gymnasium for exercises. Invariably the patients who were 12 to 13 years of age showed an increase of the scoliosis...it was therefore assumed that exercises and spinal motion made the curve increase". Except in some isolated cases, program of scoliosis exercises for patients continued to be looked upon with skepticism. In the American Academy of Orthopedic Surgeons 1985 Lecture series, this statement appears:"Physical Therapy cannot prevent a progressive deformity, and there are those who believe specific spinal exercises programs work in a counterproductive fashion by making the spine more flexible than it ordinarily would be and by so doing making it more susceptible to progression". Overemphasis on flexibility was wrong. Adequate musculoskeletal evaluation has been lacking, and as a result there has been little scientific basis upon which to justify the selection of therapeutic scoliosis exercises. Scoliosis is a problem of asymmetry. To restore symmetry requires the use of asymmetrical scoliosis exercises along with appropriate support. Stretching of tight muscles is desirable, but overall flexibility of the spine is not. It is better to have stiffness in the best attainable position than to have too much flexibility of the back. Insufficient awareness of his/her own posture which makes children less involved in the treatment process. Myofascial limitations which make three-plane corrective movements of scoliosis corrections difficult. Disturbed stabilization of lower trunk. Increased myofascial tension between the thoracolumbar scoliosis apex and the iliac crest which limits the spine shift of the scoliosis correction. Limited mobility of 3-4 ribs on the side of the scoliosis concavity, disturbed mechanism of thorax movements during breathing (breathing with convexities). Incorrect posture patterns caused by the long-lasting scoliogenic stimulation. Scoliosis exercises should be carefully selected on the basis of examination findings. There must be adequate instruction to ensure that scoliosis exercises will be performed with precision. The object is to use asymmetrical exercises to bring about optical symmetry. Regarding the thoracic curve correction, the subject reaches in a diagonally upward direction, slightly forward from the coronal plane, sitting tall with spine in as good anteroposterior alignment as possible. The aim is to practise holding the corrected position in order to develop a new kinesthetic sense of what is straight. The faulty position has become so customary that the straight position feels abnormal. The person who monitors this exercise should stand behind the subject as the exercise is being performed to be sure that both curves are being corrected at the same time . In a right thoracic, left lumbar scoliosis, there is often weakness of the posterolateral part of the right External oblique muscle, and shortness of the upper anterior part of the left External oblique. In the supine position, the subject places the right hand on the right lateral chest wall, and the left hand on the left side of the pelvis. Keeping the hands in position, the object of the exercise is to bring the two hands closer by contracting the abdominal muscles, without flexing the trunk. It is as if the upper part of the body shifts towards the left, and the pelvis shifts towards the right. By not allowing trunk flexion, and contracting the posterior lateral fibers of the External oblique, there will be tendency toward some counter-clockwise rotation of the thorax in the direction of correcting the thoracic rotation that accompanies a right thoracic curve. Perform vice-versa for left thoracic, right lumbar scoliosis. 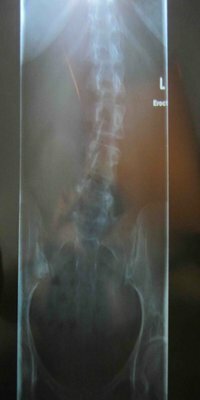 All too often, early cases of lateral curvature are "treated" merely by observation and x-rays at specified specified intervals. Early tendencies toward a lateral curvature are potentially more serious than the anteroposterior deviations seen in the usual faulty postures. Instruction in good body mechanics and appropriate scoliosis exercises, plus the necessary shoe alteration to mechanically assist in correction of allignment constitutes more rational treatment than mere observation. Correction of lateral pelvic tilt associated with a lateral curvature can be helped by proper heel lifts. Cooperation by the subject is of utmost importance. The lifts can be used in all shoes and bedroom slippers. But no amount of lift can help if the subject continue to stand with weight predominantly on the leg with the higher hip and with knee flexed on the side of the lift. If tightness develops in the Tensor fasciae latae and Iliotibial band on one side, the pelvis will be tilted down on that side. If there is Gluteus medius weakness on one side, the pelvis will ride higher on the side of the weakness. The habit of standing with weight mainly on one leg and the pelvis swayed sideways weakens the abductors, especially the Gluteus medius on that side. If tightness of the Tensor fasciae latae on one side and weakness of the Gluteus medius on the other is mild, treatment may be as simple as breaking the habit and standing evenly on both legs. If the imbalance is more marked, treatment may involve stretching of the tight Tensor fasciae latae and Iliotibial band and use of a lift on the low side. The lift will help stretch the tight Tensor and relive strain on the opposite Gluteus medius. Along with the use of appropriate Scoliosis exercises, it is important to avoid those exercises that would have an adverse effect. There is an inherent danger in increasing overall flexibility of the spine. Gains in flexibility in the direction of correcting the curves are indicated, provided that strength is also increased in order to maintain the corrections. If the subject has the potential for gaining in strength, and is dedicated to a strict program of strengthening exercises and the wearing of a support, scoliosis exercises that increase flexibility can have a desirable end result. A subject who is developing a kyphoscoliosis along with a lordosisshould not do back extension exercises from a prone position. In an effort to obtain better extension in the upper back, the low back problem increases. Extension of the upper back may be done sitting on a stool with the back against a wall, but the low back must not arch in an effort to make it appear that the upper back is straight. In the same instance, "upper" abdominal exercises by the trunk curl or sit-up should be avoided even if upper abdominals are weak. The exercises will be counter productive because curling the trunk is rounding the upper back. If there is a developing kyphoscoliosis, such an exercise would increase the kyphotic curve. Scoliosis Exercises of the lower abdominals, in the form of pelvic tilt, or pelvic tilt and leg sliding, emphasizing the action by the External oblique, would however, be strongly indicated. 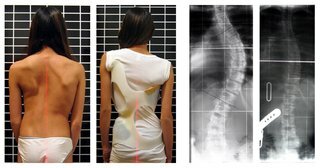 The significance of muscle imbalance and overall faulty posture as etiological factors in idiopathic scoliosis should not be overlooked. Scoliosis is a complex postural problem. As such, it calls for thorough evaluation procedures to determine the existence of weakness or tightness of muscles that results in distortion of alignment. In addition to scoliosis exercises and proper shoe corrections, many early scoliosis patients need some support. It may be that only a corset type of support is needed or, as in more advanced cases, a more rigid support. There are two main types of braces. Braces can be custom-made or can be made from a prefabricated mold. All must be selected for the specific curve problem and fitted to each patient. To have their intended effect (to keep a curve from getting worse), braces must be worn every day for the full number of hours prescribed by the doctor until the child stops growing. Milwaukee brace – Patients can wear this brace to correct any curve in the spine. This brace has a neck ring. Thoracolumbosacral orthosis (TLSO) – Patients can wear this brace to correct curves whose apex is at or below the eighth thoracic vertebra. The TLSO is an underarm brace, which means that it fits under the arm and around the rib cage, lower back, and hips. Today, there are newer materials that provide greater versatility and ease of handling, but the basic principles for use of supports remain with little change: Obtain the best possible allignment; allow for expansion in the area of concavity; apply pressure in the area of convexity to the extent tolerated without adverse effects or discomfort. Instead of waiting to see if a curve gets worse before deciding to do something about it, why not treat the problem to help prevent the curve getting worse? Doing something in the very early stages of treating a lateral curve does not mean getting involved in a vigerous, active program of exercises, but, rather, prescribing a few carefully selected scoliosis exercises that help to establish a kinesthetic sense of good alignment. It means providing good instruction to the patient and the parents in how to avoid habitual positions or activities that clearly are conducive to increasing the curvature. It may mean taking a picture of the child's back in the usual sitting or standing position and taking another in a corrected position so the child can see the effect that the scoliosis exercise has on the posture. It also means providing incentives that help keep the person intrested and cooperative because achieving correction is an ongoing project. For those in whom the curve has become more advanced, it is necessary and advisable, in many instances, to provide some kind of a support in order to help maintain the improvement in alignment that has been gained through an scoliosis exercise program. Scoliosis exercises patterns of adults and children vary widely. A series of safe and effective abdominal exercises that strengthen the back and improve posture are leg and arm extensions, back extension, triceps raise, bent-over raise, standing raise, upright row and one-arm row. When a scoliosis curve is progressive and severe, therapeutic scoliosis exercises are not a substitute for surgery. Scoliosis Exercises 1 through 5 are held to the count of five and done ten times once daily. Exercises 6 and 8 are to be done many times a day. 1. Pelvic tilt backlying with the knees bent.Lie down on your back with knees bent. Keep the shoulders flat on the floor and breathe regularly. Tighten the buttocks. Force the lumbar spine towards the bars by tightening and pushing backward with the abdominal muscles. 2. Pelvic tilt supine with the knees straight. Lie down on your back with knees straight. Repeat the same procedure mentioned above. 3. Spine extension in the facelying position.Lie flat on the stomach, with arms on the side. Tilt the pelvis, pull away from the front of the girdle. Raise the head, arms and shoulders about 6 inches against resistance between the shoulder blades. 4. Pushup with the pelvis tilted. 5. Filling out the “Thoracic Valley.” Lie on your side with a small pillow under the thoracic pad. The top arm and leg should be straight, lower arm and leg bent. Tilt the pelvis. Breathe in while pushing chest back toward the posterior uprights. 6. Pelvic tilt standing.In standing position relax the knees, tilt the pelvis by pulling in the abdomen and tucking the hips under. Walk, holding the tilt. Make this posture a habit. 7. Active correction of the Thoracic Lordosis and Rib Hump. Tilt the pelvis in the standing position. Inhale deeply, spread the ribs and press the chest wall backward toward theposterior uprights. 8. Active correction of the curves.Tilt the pelvis. Keep the pelvis tilted and shift away from the Thoracic Pad. Same with the Lumbar Pad. Now, tilt pelvis shift away from both pads and stretch up tall out of the brace. Exercises are to be held for the count of 5 and done 10 times once or twice daily. 1. Pelvic tilt backlying with the knees bent.Keep the shoulders flat on floor, but breathe regularly. Tighten the buttocks. Force the small fo the back into the floor by tightening and pushing backward the abdominal muscles. Try to “Crush” the Therapist’s hand under the back. 2. Pelvic tilt with the knees straight.Lie down flat on the back with knees straight repeat the same procedure. 3. Sit up with pelvic tilt.With the knees bent, tilt the pelvis and hold the tilt. With the elbows straight, roll up to touch the knees with fingers. Roll back down slowly, then release the tilt. 4. Deep breathing exercises.Divide the chest into three parts; abdomen, lower ribcage and upper ribcage. Inhale deeply and then exhale completely in each part. Later, when you can do this well, combine all three into one deep breath. 5. Hamstring stretch.Sitting with legs out in front of you, touch your toes. As you progress, try to touch your head to your knees. 6. Back stretch. Sitting Indian style, touch head to floor in front of you. 8. Back strengthening.Sit Indian style with back as flat as possible to the wall. Hold a ball overhead and raise straight up. Be sure to keep your elbows to the wall. 7. Rotational stretch.Sitting Indian style with hands behind head, rotate as far as possible from side to side trying to touch your elbow to the opposite knee. 9. Spine extension in the prone (facelying) position. Tilt the pelvis, make a “Tunnel” under your abdomen. Arms at your sides, palm down. Pinch shoulder blades together and raise head and shoulders and arms about 6 inches from the floor against resistance. 10. Pushup with pelvis tilted.Be sure you are a straight line from knees to shoulders. 11. Pelvic tilt in the standing position.With the head, shoulders and back against the wall and the heels 3 inches from the wall, stand tall. Relax the knees, tiltthe pelvis. Walk away holding the tilt. Make this posture a habit. Learn to do this correction without the wall; pull in tummy and tuck hips under. 12. Side stretch standing.Standing with one arm overhead and one arm at side, bend to the side opposite the raised arm. 13. Side stretch sitting on heels.Sit on heels, forehead near floor, arms outstretched. Stretch out your arms and slowly bend your trunk to one side. Repeat to other side. 1. Bicycle.Lie down flat on the floor, with the legs off the floor. Now try mimic pedaling a bicycle. 2. Abdominal strengthening.With knees bent, back flat to table, rotate knees side to side. 3. Back strengthening.Sitting on your heels, hands behind your back, keep tummy on your thighs. Lift head and shoulders. 4. Back strengthening.Sitting in a chair, lean forward with tummy on your knees, hands behind your head. Raise head and shoulders only. 5. Back strengthening.With waist at edge of table, raise trunk and arms in straight line to table. 6.Hitch ExerciseFor lumbar curve or thoracolumbar curve, another option is hitch exercise. Patients are instructed to lift their heel on the convex side of their curve while keeping their hip and knee straight, and to hold the hitched position for 10 seconds. In the hitch position, pelvis on the convex side is lifted, lateral tilt at the inferior end vertebra is reduced or reversed, and the curve is corrected. Yoga exercises are very useful in providing relief from scoliosis. They restore the normal shape, function and mobility of the spine. The most effective yoga exercises include passive back arch, crocodile twist, supine knee chest twist, and other trunk and pelvic exercises. These exercises are quite helpful in raising one's lowered shoulder and decreasing back pain. Deep breathing exercises are given to the patient to increase the vital capacity. Early toe, ankle and upper arm movements within the limit of pain must be initiated as early as possible. Change the position of the patient every 2 hours. Full range passive movements are given to hip and knee joint in addition to activities of first two days. Active movement must also be initiated within the limit of pain. Appropriate techniques for rolling, sitting and standing are taught to the patient. The patient is encouraged to do all the above activities without giving much pressure over the spine. The patient is to be made ambulatory as soon as possible. Hence first balancing is taught to the patient. As soon as the patient is able to balance himself, he is given gait training with the help of parallel bars, crutch or cane.